A specially commissioned opera by Clive Osgood for the singers of ITP. Semi-staged and accompanied by a professional chamber orchestra. Highway robbery, thief catching, murder plots, carousing, scheming and, ultimately, redemption – The Beggar’s Opera has them all! It’s funny, fast-paced and irreverent but has a serious side as well; the piece takes satirical aim at everyone from politicians to criminals, highwaymen and prison-breakers and also addresses social inequity and libertarian values. Bring a picnic to enjoy in the beautiful gardens of Wardley Farm Barn from 6pm. Marquee available for inclement weather. Tables & chairs provided. Gilbert & Sullivan’s superb one act comic opera sung by the energetic and talented cast of ITP! Can you sue someone for breaking off an engagement? 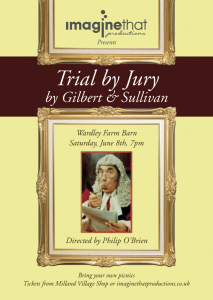 In this hilarious courtroom farce Trial by Jury, it’s a very serious crime! If you'd like to find out more about coming to one of our shows, booking Imagine That for your event or becoming a member of our cast or crew - just send us a message! CIC is a Community Interest Company, registered in England and Wales with the Company Number 10070877. It’s important to us to support our community as well, so many of our events raise money for local charities and we perform one free community event a year.